Clear Creek is located on the east side of Zion National Park near the east entrance to the Zion-Mt. Carmel Tunnel. It is a wash that runs along the side of the Zion-Mt. Carmel Highway. Although this drainage is usually dry, water can flow when the conditions are right in Zion. Difficulty: Moderate because it's a route rather than a trail, but the hiking is not exerting. Trail Conditions: The path is through the usually dry Clear Creek stream bed. There are large boulders in some sections and sand in others. This area has a moderate flash flood danger so check weather conditions before hiking. Trailhead: Canyon Overlook Parking lot - East side of the Zion-Mt. Carmel Tunnel. Off the Beaten Path: Yes, although the trailhead is in a hectic area. Best Season: May - October when the wash is usually dry. Water Availability: Usually none. Bring your own. From the east side of Zion National Park, drive along the Zion-Mt. 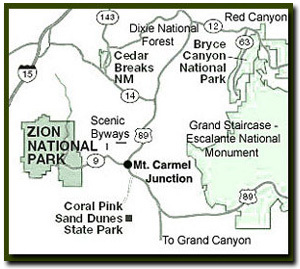 Carmel Highway and park at any of the areas just east of the Zion-Mt. Carmel Tunnel. The closest parking is just east of the tunnel. Walk to the restroom at the corner of the parking lot and locate the path of use, heading down into the drainage. The drainage runs both right and left. To the right is the Pine Creek drainage leading to a technical slot canyon that requires a permit and rappel equipment. To the left is Clear Creek. The walls will close in quickly as the sandy, pebbled path runs east. Follow the drainage through the slot canyon, returning after the wash flattens out. Clear Creek runs along the Zion-Mt. Carmel Highway and even though the usually dry creek bed is about 50' below the road, cars and people are often heard along this route. It's always nice to access a hike without getting on the shuttle, so you have access to your own vehicle, your ice chest and other items of importance that you might keep in your car while exploring Zion National Park. This short slot adventure is charming, easy to get to and close to civilization. Few use this route so it is a path that is less traveled, however parking can be a problem because it's a busy parking area. The views of east side mountains, while hiking through the slot, are magnificent. Clear Creek continues past the lower Clear Creek slot section. 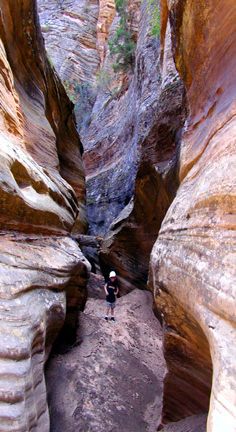 The usually dry creek bed can be hiked and many side canyons, such as Hidden Gardens, can be explored. Minor slot sections are found along Clear Creek and the hike through even the flat sections of the stream bed are enjoyable and scenic. Clear Creek is a fun little slot located on the east side of Zion National Park which shares the Canyon Overlook Trailhead. Hidden Gardens is a wonderful excursion that can be explored from the section of Clear Creek near the small tunnel in Zion National Park. The Gifford Canyon trailhead shares the same location as Lower Clear Creek. Take this option if looking for solitude. Note: Using two cars is an option if large sections of Clear Creek are to be explored. Gifford Canyon has a flash flood danger. Be sure to check weather conditions at the Zion Canyon Visitors Center before entering any slot canyon.